They tweeted, they pinned, they created videos and penned bios. They got both visitors and interviewers excited. We’re thrilled to announce the summer interns for 2012. Win a paid summer internship in NYC or SF! Are you looking for an internship, or know a college student who is? How about spending the summer in New York City or San Francisco at The Huffington Post, TechCrunch, AOL Video, or about.me? We’re giving U.S. college students the chance to win the ultimate summer internship. To enter, opt-in and update your about.me page to show the world why you’re the best fit for the job. To win, get everyone you know to vote for your page! Visit our contest page for details on each of the internship positions, tips on how to create a great about.me page and full terms and conditions. Last day for voting is April 22nd so make sure your page is eligible by opting-in to win today. Check it out! Some of the new faces of about.me are being featured on TaxiTV across New York City, Chicago, and Boston. You might also see them on YouTube and Hulu commercials, so keep an eye out and tweet @aboutdotme if you see this video in the wild. 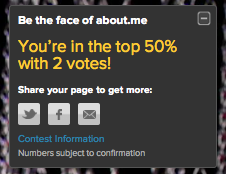 The votes are in – our contest to find new faces for about.me is officially over! We wanted to send a huge THANK YOU to each and every one of you who participated, and to everyone who supported their friends by voting day after day. We have seen some amazing profiles and are extremely impressed by our community’s creativity. Curious to know who is going to be featured on our billboard in Times Square? We are too! The team is currently going through the top profiles, contacting finalists, and will announce the winners next week. Stay tuned! So, you’ve entered our contest to become the face of about.me – now what? How can you secure a coveted spot on the Times Square billboard? There are still 22 days remaining! We’re here to help. We’ve added a bunch of ways you can share you page and ask for votes – on Twitter, Facebook and via email, right from your page. Click the icon you’d like to share to, add some flair to the text, and share away. We’d recommend switching it up and sharing to each service a couple times a week. We know you have other networks you are a part of however, so be sure to share beyond what we offer. Make sure you are sharing places where you have friends and followers – like Instagram, tumblr, Google+ and formspring. Another way to garner votes is to blog about your entry, and why you should win. What makes your page unique or your story special? Share the post to Twitter, Facebook and beyond to provide visitors a reason to vote for you. Better yet, create a website or Facebook page, touting why you should win. Feeling extra creative? Grab a friend or two and make a video all about why YOU should be the face of about.me. Share your video on YouTube, Vimeo, Google+ and more to let everyone know you’re a star! Finally, consider representing a cause. We’ve seen a number of pages focused on raising awareness for a campaign. This opens your voting audience up to anyone who supports the same cause as you.